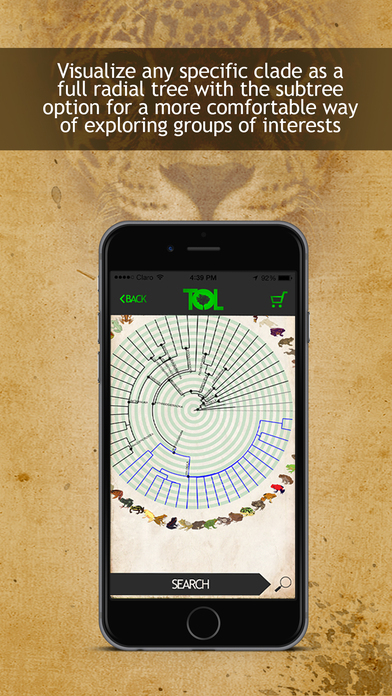 Tree of Life App is an interactive and illustrated family-level phylogeny of living beings based upon a synthesis of data from thousands of published studies from the primary literature. Main groups of organisms –from Bacteria to Vertebrates- are displayed in the initial tree as collapsed branches that can be opened to view family level relationships. Over 5000 families are included in the current version. Tree of Life Pro allows users to open all the locked groups in the Lite version (BACTERIA, EURYARCHAEOTA, EXCAVATA, VIRIDIPLANTAE, HAPTOPHYTA, AMOEBOZOA, FUNGI, HEXACTINELLIDA, CALCAREA, SCALIDOPHORA, TARDIGRADA, NEMERTEA, SYNDERMATA, TUNICATA). Moreover, users will have access to the currently unavailable groups that are being developed and will be made available very soon (RED ALGAE, INSECTS, MOLLUSKS, etc). Tree of Life App is constantly being updated to include recent findings, guaranteeing to illustrate the most up-to date state of the art about evolutionary relationships among living beings. -Plants (Viridiplantae), Fungi (Fungi), and Opisthosporidians (Opisthosporidia) are now available in the PRO-version, leading to a >5000 total families to the current tree.